Convection ovens used to be a staple appliances in professional and large scale ovens, but recently that has changes and convection ovens have become popularized enough to be found in everyone’s kitchen. The fact that a convection oven works in a much more convenient way is one of the main reasons that it is taking over the conventional oven, which you rarely find these days. In order to understand the shift from conventional to the convection oven, we should look at the functions of the two ovens and see how and why people seem to be leaning towards the more modern convection oven. The main difference between the convection and conventional oven is the way that they produce and circulate heat, and how that affects whatever is being cooked in the oven. So the main difference is the fan and exhaust system that comes with the convection oven, and this is what makes it different from the conventional oven. A conventional oven uses the heat that is generated from top and bottom of the oven but there is no way to circulate it evenly throughout. The exhaust and fan in a convection oven make it possible to circulate the heat being produced, evenly throughout the oven so whatever is being cooked gets even heat. Another quality of a convection oven is that it removes excess moisture and that helps the food get crispier easily and also cook faster and evenly. Obviously, if you are used to the traditional oven it will take some time for you to get used to the convection oven. The cooking times and temperatures vary greatly with the two ovens even if you are cooking the same thing. After a couple of goes, you will get a hang of it and know how to adjust the temperature according to the different dishes you cook and bake. Cookies are the best snack and dessert food that one can have, they are crisp and chewy and sweet, absolutely delicious. And what makes them even better is if they are baked in a convection oven because that circulating even heat allows you to get an even browning and crispiness on your cookies. Another advantage is that you will not have to keep rotating the cookie trays in hopes to get an even cook on them because the oven will do that on its own. Plus you can make use of all the extra space, you can add as many trays as the oven allows and not worry that they won’t all cook properly, because they will. Since all of this is about air circulation and flow, you have to keep in mind a smart tip for your cookie sheets, buy the rimless ones. This will make sure that the rims don’t create any kind of air blockage either to get that even cook going. Another advantage of a rimless sheet is that you can scrape those cookies off without any struggle. Although don’t attempt making anything that might leave a liquid behind on rimless sheets. As I am sure you all know, the material that you are baking can have a huge impact on the final turn out of whatever you ae making. Since the cookies are in direct contact and you want a crispy browned bottom, it is best you know what material would prove to be best. Aluminum is one of the best cookie sheets you can get because of the material it conducts heat evenly not to mention that it is super durable and can last for a very long time. The thing with aluminum sheets is that you can use them roughly and they will still last very long thanks to the sturdy material. 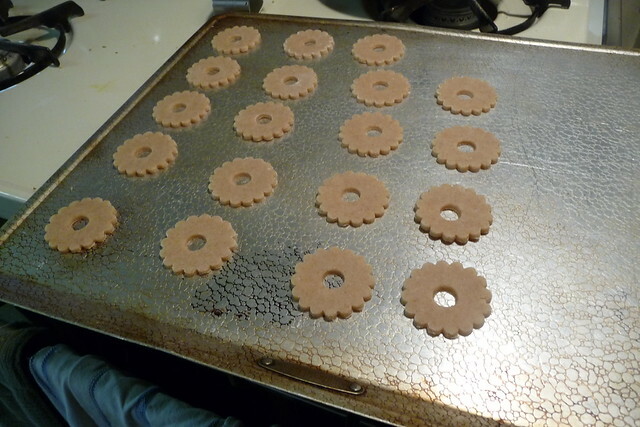 You do have to be careful about one thing though, the aluminum cookie sheets are not non-stick so you do have to apply some oil with a brush or use a spray coat just to make sure that those delicious cookies don’t stick. Carbon steel can be a little troublesome to use as the material for cookie sheets because of its lack of head conducting properties. It can take quite some to heat up properly and similarly it can take a long time to cool back down. This could be bad for your cookies because they will continue to get heat even after you have taken them out of the oven, and might over cook or burn. People still make use of these so if you do want to get a carbon steel sheet then make sure to get the thinner versions, that will work comparatively better for your convection oven. Non-sticks, as the name suggests, are non-stick because of a Teflon coating that allows your cookies to slide off easily without sticking. This is an advantage, but research has shown that Teflon can produce dangerous gasses when it is exposed to high heat and they may dangerous for your health. People still opt for these because of the non-stick convenience. Keeping in mind the best material and how the convection oven works, there is one cookie sheet which is definitely the best out there. 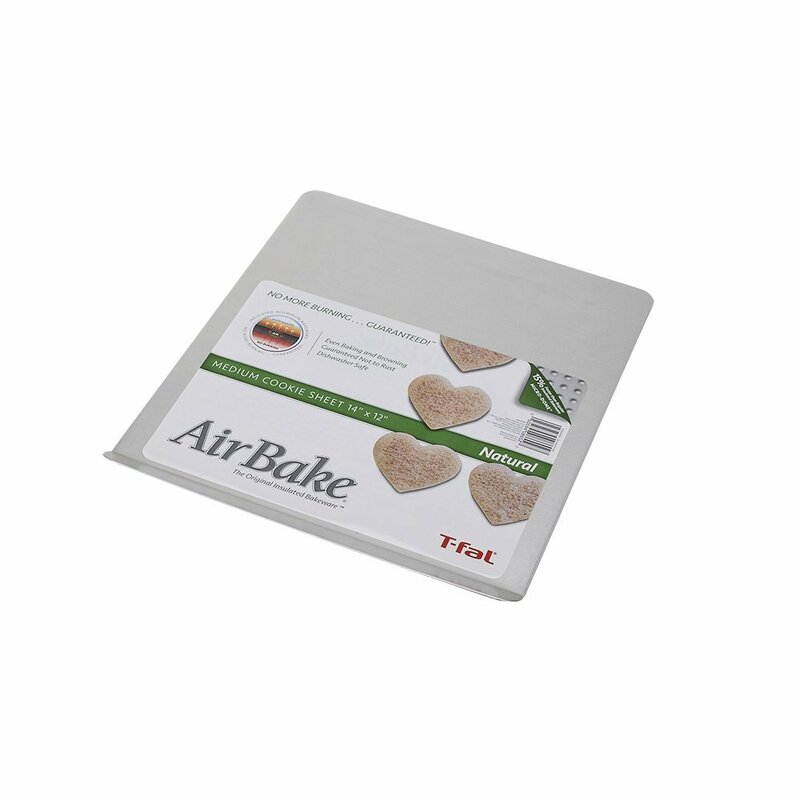 The T-fal AirBake Natural 2 Pack Cookie Sheet is a great option that costs close to nothing and will fulfill all your cookie baking needs. These sheets are rimless and made from aluminum, they do have a non-stick variety too in case you are interested in that. The set contains two sheets which are in two different sizes, 14 in x 12 in and 16 in x 14. These sizes can be pretty convenient for a regular sized oven. The T-fal AirBake also comes in other smaller sizes in case you were wondering. According to the company they are supposed to be dishwasher safe, you could clean them in a dishwasher but in order to ensure they last longer, try to hand wash them. Like we mentioned earlier, cookies are such a versatile food item, you can have it anytime and not to mention they make a great gift package too. They are a million types of cooking out there and every person has a preference, with the help of your convection style oven and your T-fal AirBake cookie sheets you can cater to all those different cookie needs and cravings. Now get your cookie recipes out and make that kitchen of yours smell delicious with the aroma of freshly baked cookies.